Today I am recycling stacks of paper out by the pile, and it is extremely liberating. As I have mentioned before next year I will be moving to a different school. I will still be a department of one, but instead at a small public school, which will be a better fit for my family and I. With the impending change, and the idea of moving all of the junk I have built up in the past three years (I can not even imagine how this works after 30+ years), it is time for some Spring cleaning. With three years of completely different plans and materials used, I have acquired a ton of stuff, both physically and digitally. You can see how I transitioned my curriculum over the past three years in this post. Basically I went from old school textbook, to new textbook with attempts at performance based proficiency assessments, to units based on novels and comprehensible input stories. I have multiple beautiful binders (above) made for my second year, nicely sorted by textbook chapter with laminated page protectors and vocabulary, activities, assessments and grammar activities to go with each unit. (#Confession: I Love making organized binders). At the time I thought I could use these activities for years, simply copy and ready I would be ready to go. I barely touched the binders at all this year. Today I went through these pretty, organized, page protectors and ripped out anything that will not help us meet out ultimate goal, student proficiency. As Thomas Sauer mentions in this post proficiency "is the ultimate outcome for any language learner, so therefore it must be the ultimate guide for us to create learning experiences." So I started going through these binders removing anything that will not move us forward in the overall goal of being able to communicate. It feels freeing and great to get rid of things, and physically proves I am moving forward. Also, I would like to move to everything that I actually use to digital if possible. I have a long way to go, but at least I am on the right path. So, my challenge to you is to purge one drawer, binder, closet, or file folder in order to #Remove2Improve. 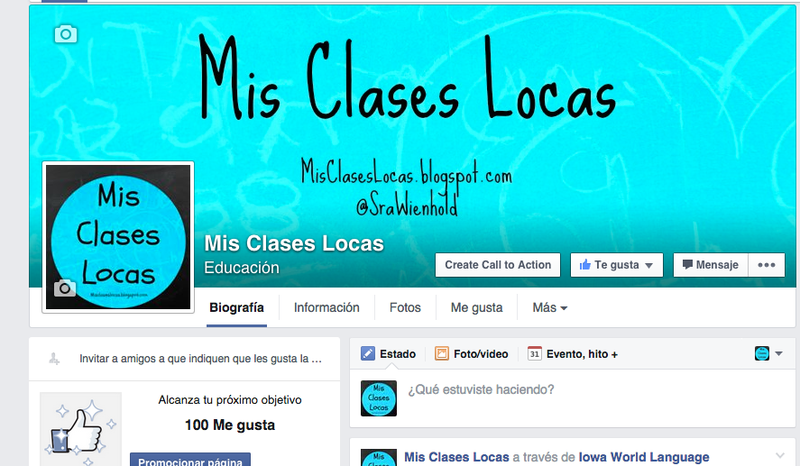 Finally, like the new Mis Clases Locas Facebook Page for updates on blog posts, shared resources from other sources, and general language teaching ideas! 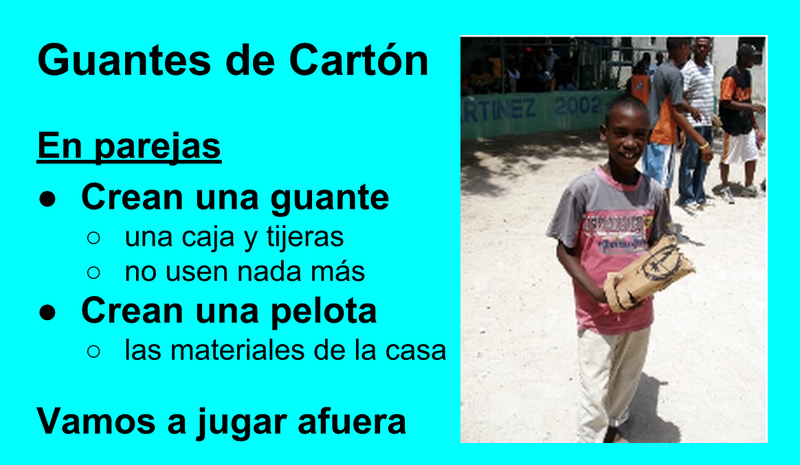 While teaching the novel Felipe Alou: Desde los valles a las montañas in Spanish II, I was inspired by this post about making cardboard gloves, like many children do in the Dominican Republic. 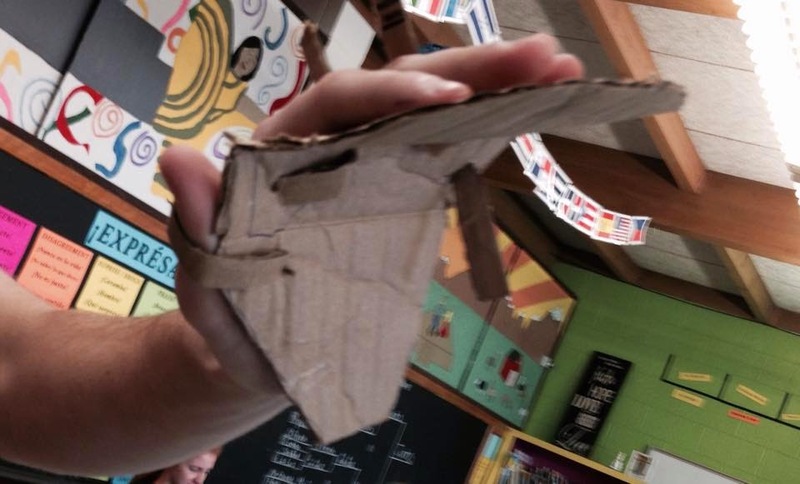 The Monday after prom is notoriously blah and low energy, so I decided to try and spice it up by making guantes de cartόn (cardboard gloves). 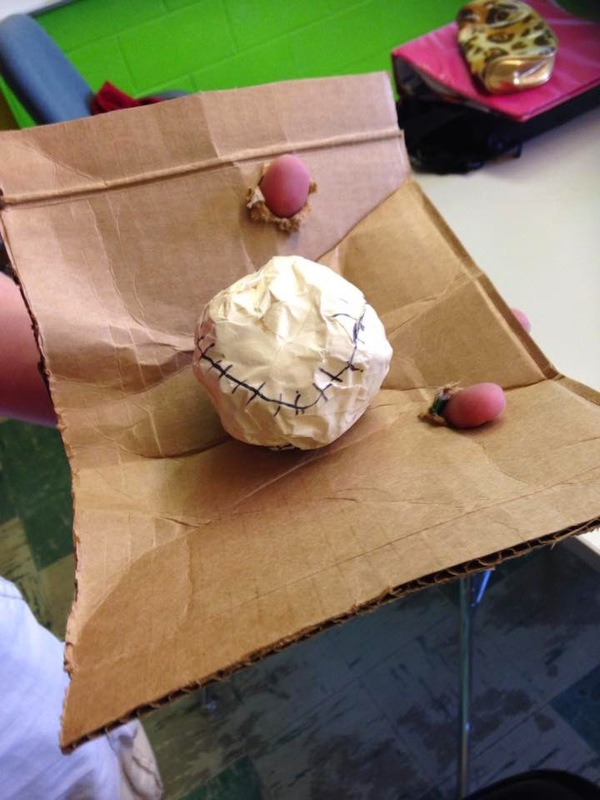 Hook - Tell students to bring in something that could be used to make a baseball. 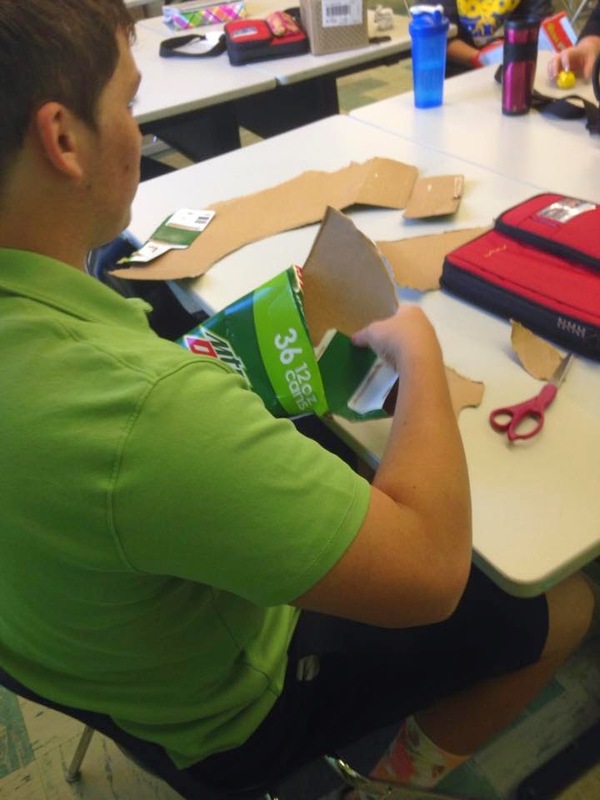 Prep - Collect cardboard boxes from the recycling, as well as get enough scissors for each pair of students. Discuss in Spanish about pobreza (poverty): would they be happy living in poverty, how would they survive, what would they have to do without, what they need to participate in favorite activities, and what they would do for fun if had very little. They should be speaking Spanish while creating (I should have done a better job making sure they had the vocabulary for staying in the TL while creating - cut, fold, etc). 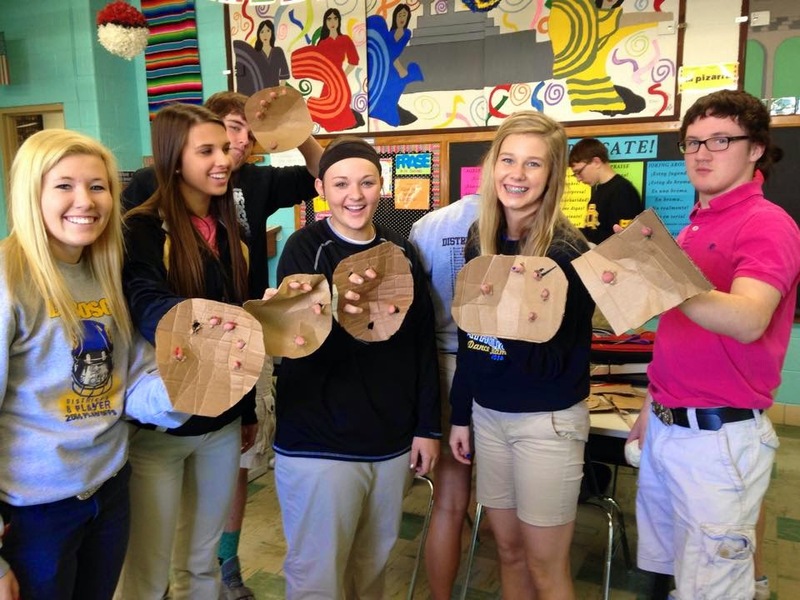 This class realized their gloves were not the best for their fingers! If it is not nice out and you are brave let students try them out in class, or head to the hallway or gym. If you would like to try and play an actual game, find a stick or old bat for an authentic feel. The plan is to head outside tomorrow to try everything out. 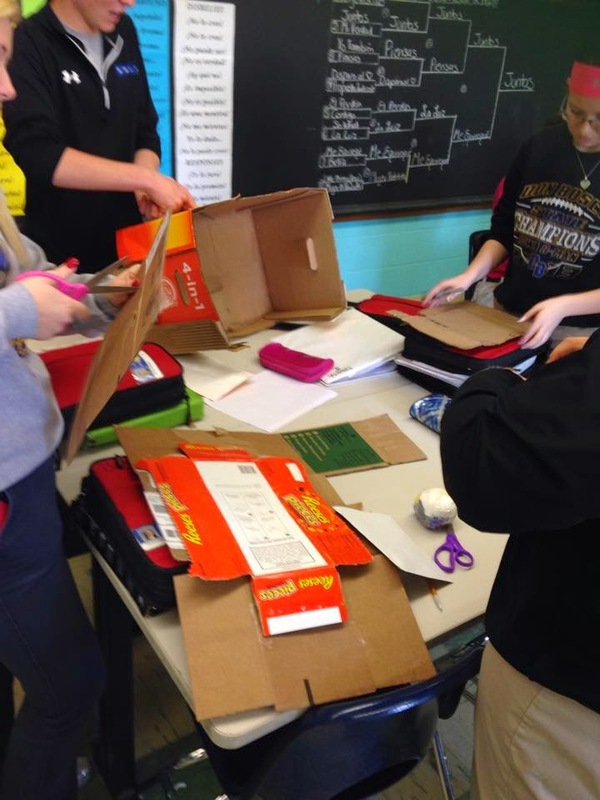 Watch Videos & Discuss - Mariano Rivera (from Panama) makes a cardboard glove. Compare the simplicity of his glove to those they tried to make in class. REFLECT! The key with any new experience is to have students reflect either out loud or in a free write about what they learned, how their perspective has/has not changed, and their empathy level for those in poverty. This is something that I will definitely keep in my plans for future years. 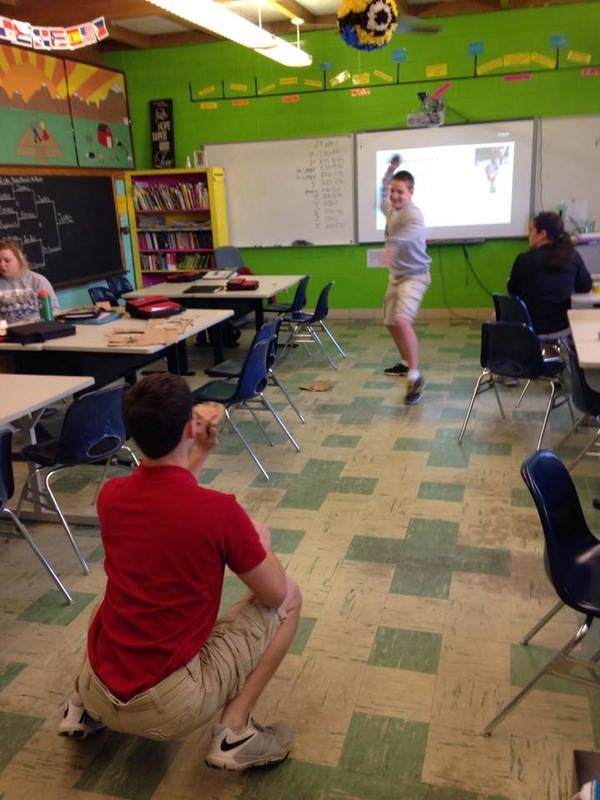 Students were engaged and energized during a usually dull Monday. Next time I will do it sooner i the novel, maybe after chapter 2 of Felipe Alou. **Update here is my assessment for Felipe Alou. After being inspired by the great idea here by Melanie to do a Google form survey of my students, I did just that. **If you have not used Google Forms, DO IT! ** I used a lot of the same basic questions to get a better feel of the strengths and weaknesses of my classes. While some feedback was amazingly complementary about them not wanting me to change school, others were brutally honest and revealed gaping holes that I need to work hard to fill. 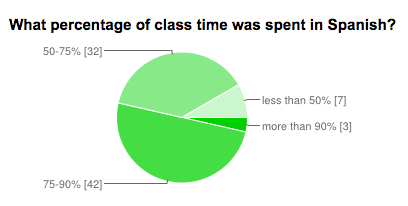 I did the survey in all levels with the students who were present that day, so these results are a mix of all classes. The question below is the one that was the biggest sucker punch and eye opener for me. I have tried VERY hard this year to try and reach the 90%+ goal for target language use. I have grown leaps and bounds in the last three years, moving from a textbook, grammar-taught-in-English class to a more comprehensible input and novel focused class. I think that I was close to 90%, but the key was that the STUDENTS were not using Spanish 90% of class, and this is my fault. 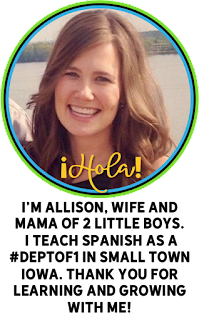 I need to create activities, and the environment where EVERYONE speaks Spanish together. Only 3.6% of my students were over 90%, and that needs to change. On the positive side, we are making progress. 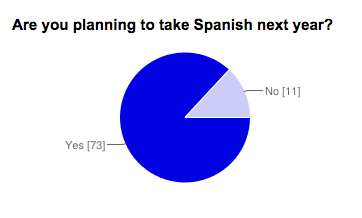 If I were to have done this survey year 1, there is NO WAY that 92% of my students would have said that over half of the class time was spent in Spanish. It is a sad but true fact that I used to teach ABOUT the language and not IN the language. Once again, here is a big goal to learn and grow from next year. I heard an idea at #CSCTFL15 to SHOW ACTFL's position statement on target language use in the classroom and explain that as a team we need to work together to get there. 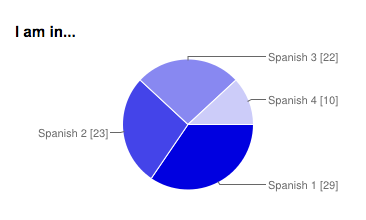 As you can see from the results below where 1 was highly disagree and 5 highly agree, my students have not been on board with only speaking Spanish in class, and we need to improve. On a positive note 87% of my students are planing on taking Spanish next year, and this includes seniors who are graduating! Retention has gone way up and I am so excited about those planning on pursuing Spanish at the University level! I also had students rank their confidence in ability to understand what they read, listen to, speak, and write in Spanish. Reading was the highest perceived ability, probably due to our novel studies. listening, speaking, and writing were all a pretty similar bell curve with room to improve. One of the most fun things to read were their favorite things in class. I asked for favorite book we read, book they read during free reading, song to listen to, song to dance to, and movie we watched. 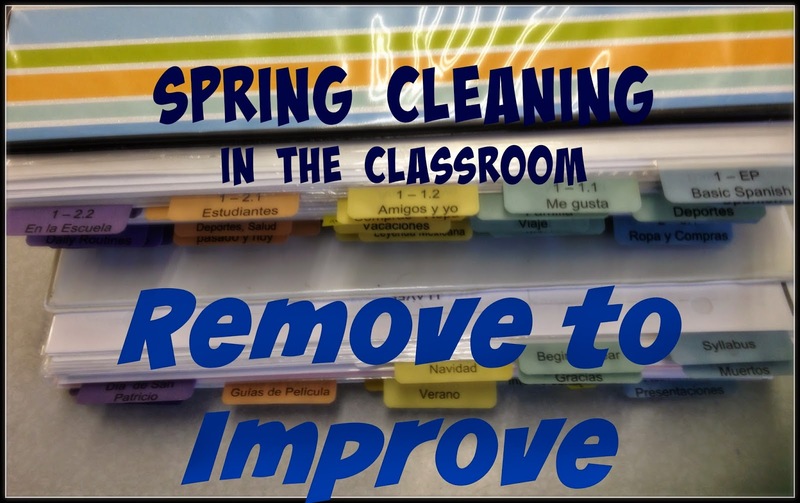 I also had an open ended question to name 2-3 activities that helped them to learn most Spanish, as well as another to list what they would get rid of in class if they could. I also listed off 15 typical class routines or activities (baile viernes, doing cultural unit, free reading, etc) for them to click their favorites in one question, and to chose what they would eliminate in another. The overall winner of everything was watching El Internado. 86% of all students chose watching movies/El Internado as their favorite part of class, and not a single person said they would get rid of it. Other top activities were Música miércoles, Baile viernes, Kahoot quizzes, and reading novels as a class. Favorite Book: Most books we read were pretty split in all classes, which shows the importance of variety! These favorite included: Brandon Brown Quiere un Perro, Tumba, Esperanza, Robo en la Noche & La Calaca Alegre, which can all be purchased through TPRS Publishing. (Sadly the tougher Cajas de Cartón did not make the list). The items most students would get rid of are using a textbook (which most classes never touched this year), worksheets, and choice real world homework. It is interesting that one of the topics that has been most popular on the blog lately, choice homework, is the item the students want to get rid of. To be honest, it is pretty much the only homework I give, so they think that by getting rid of it, there would be nothing outside of class time:) In theory it is a great idea, students choose something, anything, to use their language outside of class. It is the accountability piece they hate. Many students have found things from this list, and now do them without even requesting "credit" for them. These favorites include listing to Spanish music, binge watching El Internado, and participating in #spanstuchat. It has become an issue of heart and motivation, that many others simply screenshot activities, reuse weeks, or copy, just cheating themselves out of language practice. This is something else added to my to work on list, so if you have any ideas, let me know! Even though I know I still have a long way to go, comments like the one below from Abby S. really remind me why I am a Spanish teacher. "I just want to say that I loved Spanish 4. It was awesome. I can't say enough good things I don't think. When people ask me what my favorite class is I say Spanish because I feel proud of how much I've learned this year. At the beginning of the year I had to really pay attention to the subtitles on Internado, but my listening has improved so much that I don't need to. I love love love getting to free read in Spanish. I love to read and I just feel so accomplished when I read something in Spanish and I understand it. Thank you for giving me the opportunity to learn and grow so much. I'm going to miss you but I wish you all the best of luck next year. And thank you for making me feel confident enough in my Spanish skills to feel that taking Spanish in college was even an option for me. Abrazos!!" Survey your students, through the good and the bad, it is how we learn and grow. Abrazos! Spanish 1 has officially finished reading Tumba by Mira Canion! 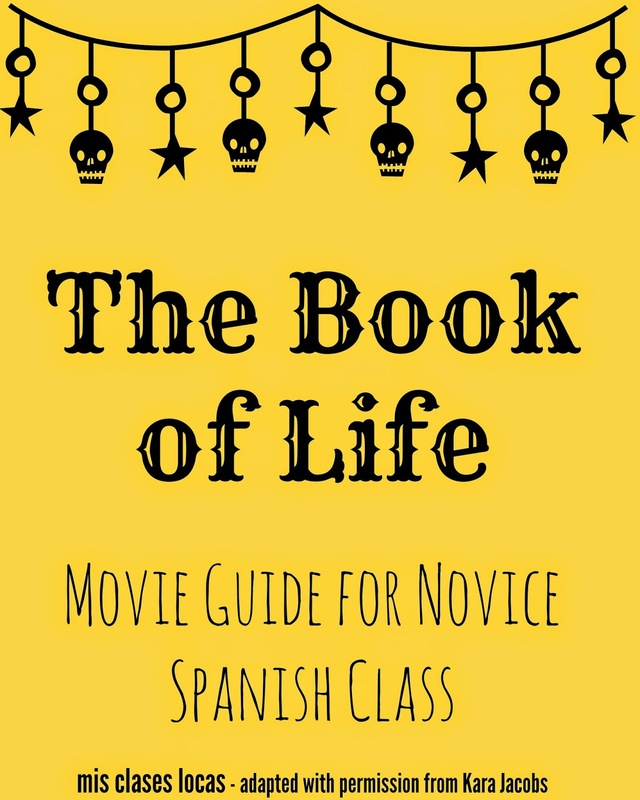 I would highly recommend it for a novice level Spanish class. Previous posts include introducing the novel, Chapter 1, Chapter 2, Chapter 3, Chapter 4, Chapter 5, Chapter 6 & Chapters 7-8. Last Thursday, we read chapter 9 together as a class, circling, checking for comprehension, and personalizing. Then last Friday afternoon the weather was a Gorgeous and sunny 75 degrees (one of the few and far between perfect days in Iowa). My upper level classes missed out since they watch El Internado on Fridays, but Spanish 1 was in luck! I decided to adapt the plans and move class outside. Give directions INSIDE before the caged animals are set free. Set boundaries as to how far students can go to work. Have tasks that do not require computers, as I did not want to risk their livelihood. As for chapter 10, we read it as a class, answered questions, and then took a fun summative Kahoot quiz. This week students will be completing interpersonal speaking assessments in pairs, as well as individual presentational writing assessments. We will finish the unit watching El Libro de Vida. 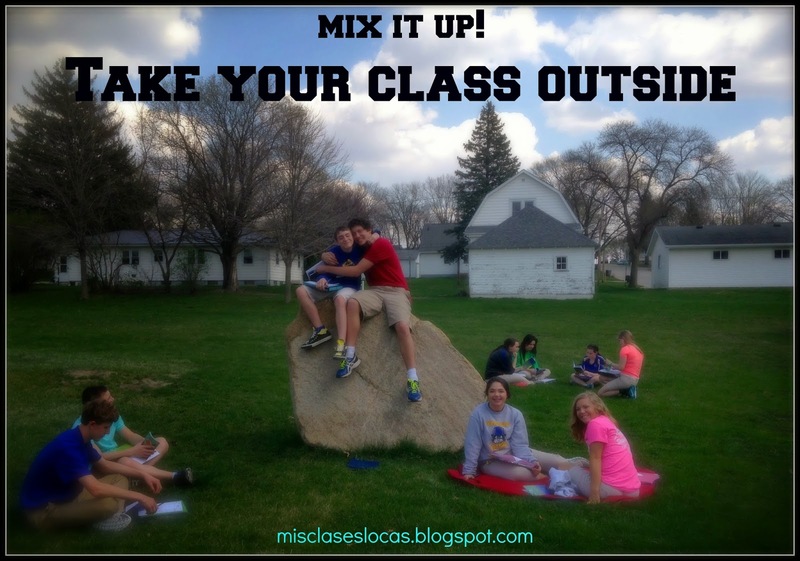 What kind of things have you done outside with your students? Here are 5 different activities that we did through chapter 7-8 of Tumba by Mira Canion. Previous posts include introducing the novel, Chapter 1, Chapter 2, Chapter 3, Chapter 4, Chapter 5 & Chapter 6. These activities could be used with any story or novel. We are going to take a little break from the Tumba-thon to talk about what we are currently reading in Spanish II, Felipe Alou: Desde los valles a las montanas. It is a great novel from Carol Gaab about the true story of Felipe Rojas Alou, available in Spanish, French and English. Felipe was a baseball player from the Dominican Republic, who came to the U.S. during the civil rights movement. If you are going to teach the novel in class, you have to get the teacher's guide & audio book. 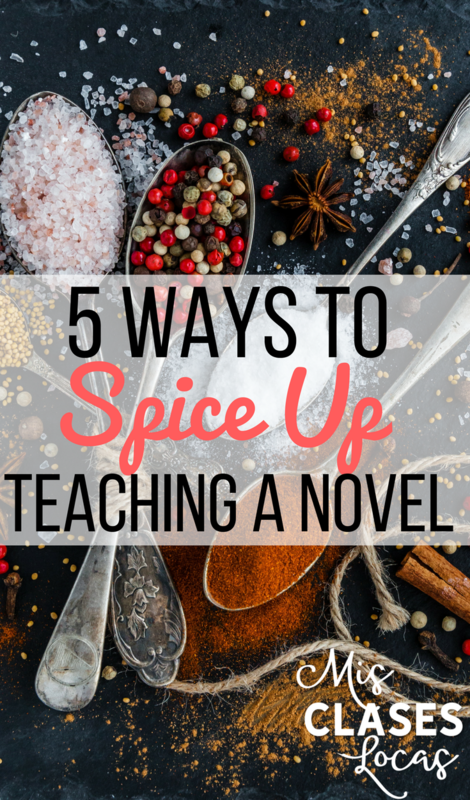 Besides scouring the teacher's guide, I also like to look around at what other bloggers have done with a novel for inspiration. We started the unit completing Martina Bex's Spanish Reading: The Dominican Republic. I was actually home with a sick little boy, so this was a great reading with comprehension questions that could be completed with a substitute. If I was there I would have divided up the topics, one for each group to do a little bit more research on, and to present their finding as experts in Geography, Merengue, etc to the class. This video demonstrates that even with the level of poverty in DR, Haiti is far worse as the poorest country in the western hemisphere. Since I teach in an agricultural area, we compared how much our students make a day detasseling, picking up rock, or doing other farm related labor, to the $3 for 15-18 hours of labor they make in the sugar cane fields. This is when I think it really hit home for some of them that at 15 years old they are making $10/hour in the fields, but an an adult is making $0.20/hour doing far harder work. La Era de Trujillo - Parte I & La Era de Trujillo - Parte II - A total of only about 3 minutes in Spanish with footage of the time of Trujillo, which is good to explain movie talk style. The Story of the Mirabal Sisters | AARP - A good 10 minute documentary about Mirabal sisters. Tiempo de las Mariposas - Trailer - Trailer for In the Time of Butterflies. These could be shown to introduce the novel, while reading, or to end a unit. In the Time of Butterflies - This movie was inspired by the true story of the Mirabal sisters who were murdered in 1960 for their part in a plan to overthrow the dictator Trujillo. Dustin Williamson shows this movie before starting Felipe Alou. Sugar - A fictional movie about a young baseball player who leaves the Dominican Republic to play in the U.S. minor leagues with the hope of making it big. I would show it to be able to compare and contrast, but this group watched it last year as a part of our sports unit. They thought it was pretty cool that he comes to Iowa and was filmed about 2 hours away. Pelotero - A documentary about baseball prospects in the Dominican Republic. The Perfect Game - This PG rated baseball movie is based on the true story of a group of boys from Mexico, who are the first non-U.S. team to win the little league world series. After reading chapters 1 and 2, discussing question from the teacher's guide, we completed this activity about schools around the world. 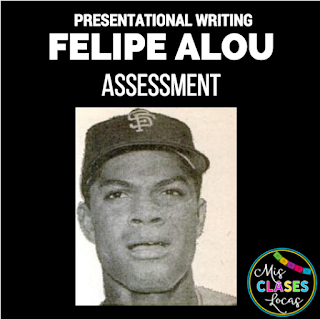 What resources do you use while teaching Felipe Alou? We are continuing with Tumba by Mira Canion in Spanish 1. Previous posts include introducing the novel, Chapter 1, Chapter 2, Chapter 3 & Chapter 4. This chapter includes lyrics from the traditional Mexican song "Cielito Lindo," and is the perfect time to add some music! There are many versions of the song, but my students favorite is the version by Ana Gabriel found here. There is also this version of adorable little Shaira's version of the song. Martina Bex has a great song activity using 3 versions of this song that is available for FREE here. In addition, chapter 5 is another perfect time for reader's theater, as it involves the introduction of a love triangle! Students love romantic drama! Ay, ay, ay, ay on the chapter 6! As I am sure you an tell from the last few posts, Spanish I is reading Tumba by Mira Canion. The teachers guide and audio book can be purchased here. Previous posts include introducing the novel, Chapter 1, Chapter 2 & Chapter 3. Chapter 4 has multiple different elements that could be used to expand on culturally, including Mexican food, caves and the Mexican Revolution. 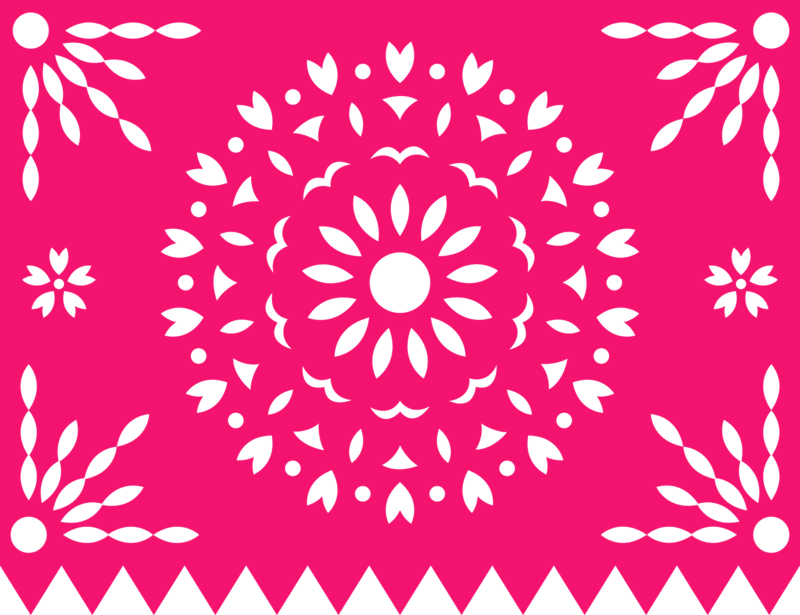 I chose make the cultural focus for this chapter to be the Mexican Revolution. I figure it is one more time that I can hammer in that the upcoming holiday of Cinco de Mayo is NOT Mexico's Independence day! (We also participate in a class wide "Grito" in September during the actual Independence Day, because the small fact that Cinco de Mayo does not equal independence day, is one of the things that I want students to leave Spanish class knowing). There are a couple of reasons that I do not want this to become a full blown intense history lesson. I want to keep the class discussion in the target language, so it needs to stay at their level. They do not need to know every detail. 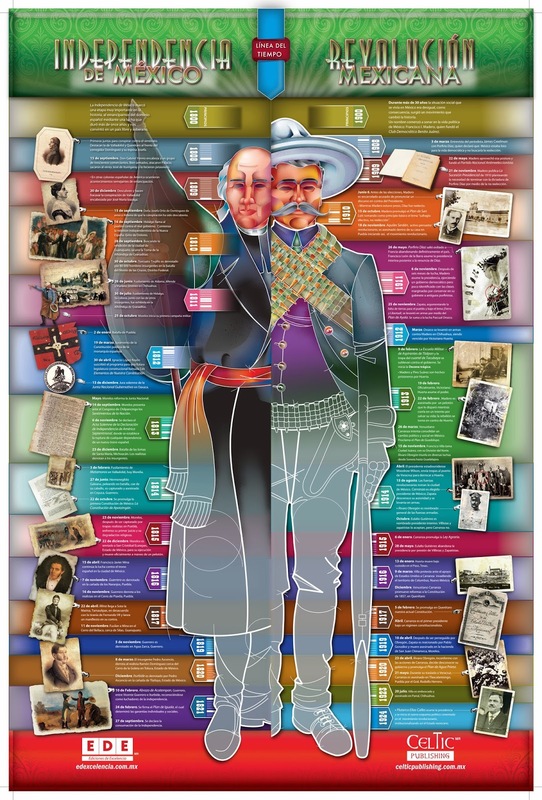 My goals are simply "I can compare what time periods the Mexican and U.S. Revolutions took place," and "I can describe what happens in a revolution." To start we talked about when the U.S. revolution took place. (Cue face palm for the number of freshman who can not state when this was). It is important when comparing cultures to first start with making sure the students understand their own culture, before moving on to comparing another. We kept it basic with the "W" question words: who, what, when, where, why. I then showed this infographic which I think highlights the basic information in a concise way for the students. 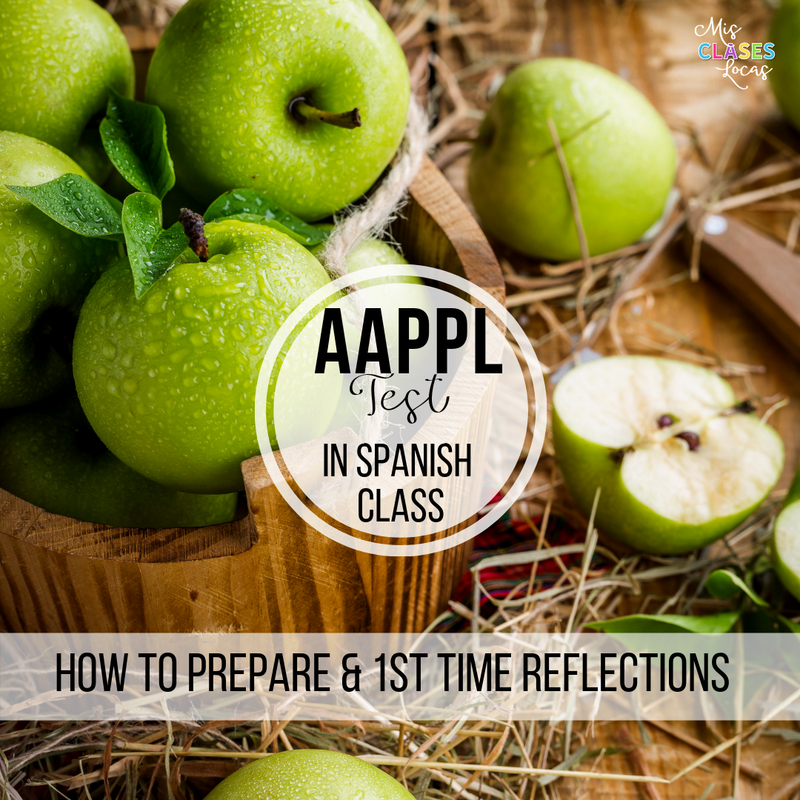 We discussed basic questions in Spanish such as: when did this take place? How many years did it last? Who are important people involved? Was this before or after the U.S. Revolution? What was happening during this time in the U.S./world? Do people die during revolutions? Who starts revolutions? According to the infographic, the beginnings of the movement began in 1908, so students could go either way for possible or probable based on their reasoning. They obviously can not tell if he was nice or not based on the picture, but using the cognate dictador and knowledge of other dictators they can decide if it is possible or probable. After reading the chapter we were able to talk about the poor versus the rich during the revolution, and the connection to the book. I had students read the authors note that is in English at the start of the book to reiterate what kinds of things were happening between the rich ranchers and poor revolutionaries. 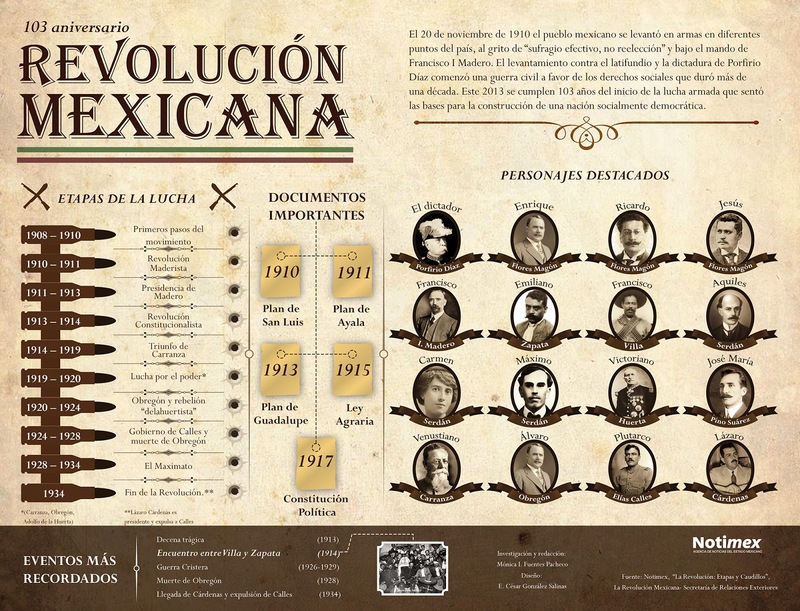 That is far as we took it with the Mexican Revolution, but if you are interested, here are a couple more resources I found that you could use. This video gives a good overview in English, but I did not want my students overwhelmed with all the fact, people, places and dates presented. This infographic gives a better big picture of all of the years involved, but also has a lot of text to sort through for a novice. It would be useful for reading comprehension if specific questions were asked in English to look for. Now on to chapter 5! Spanish I is continuing to read Tumba by Mira Canion. The teachers guide and audio book can be purchased here. Previous posts include introducing the novel, Chapter 1 & Chapter 2. Chapter 3 is focused on the alters created for Day of the Dead. Before starting the chapter we did the following activities related to las ofrendas and los altares. 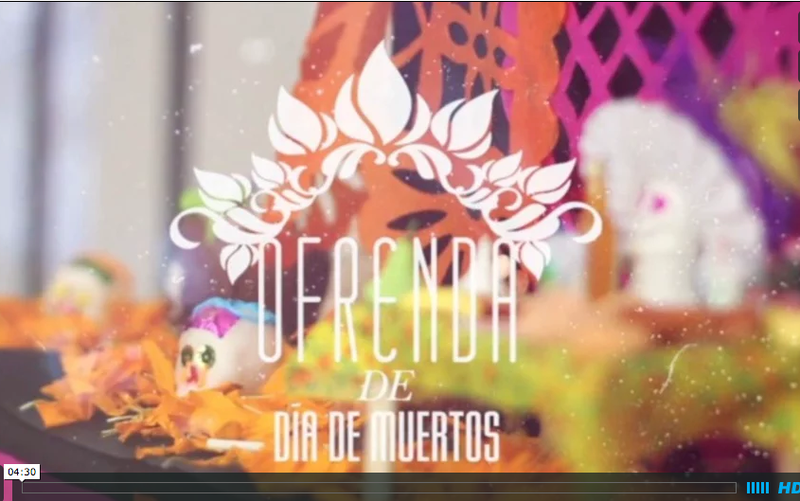 This Video on Vimeo does not have any words, but instead shows some of the vocabulary on the screen related to an ofrenda such as papel picado, flores, la Catrina, calaveras and more. It is perfect to use for movie talk, pausing and describing what is being shown. 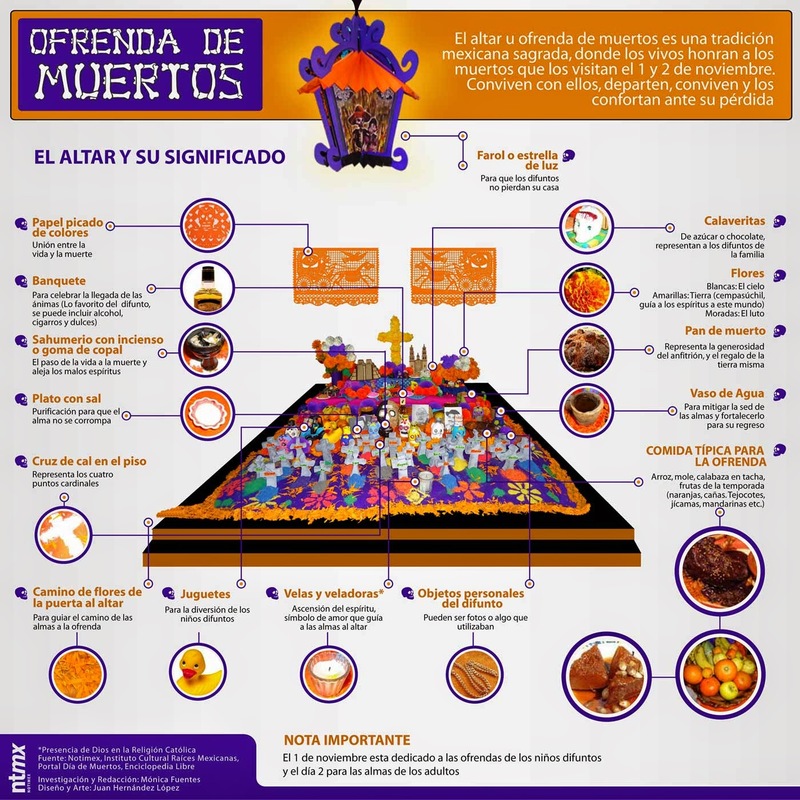 We used this infographic last fall during our Day of the Dead mini unit. Students used their computers to view the infographic, while answering reading comprehension questions English. It could also be printed, or posted in the room to do a similar activity. To review for this chapter, I projected it, and we discussed in Spanish what elements are typically included. We also discussed what they would put on an alter of a loved one. 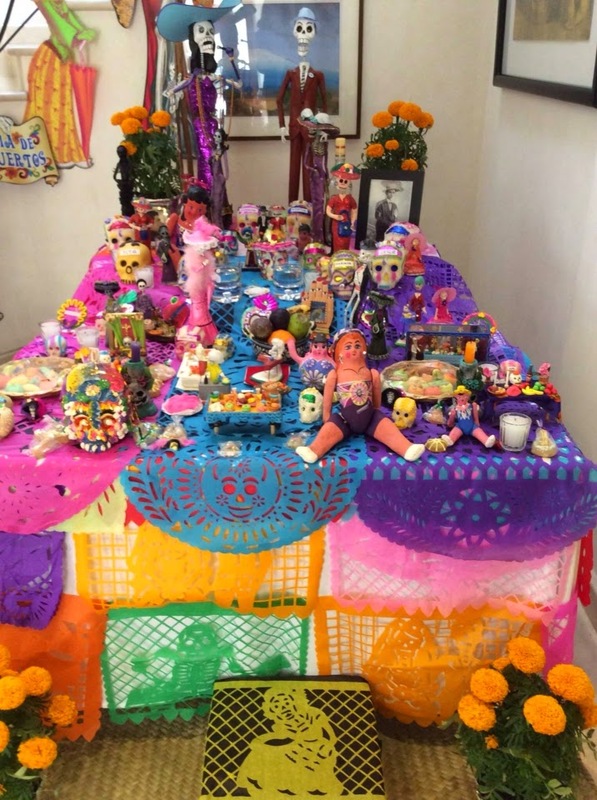 If we had not already done this in the fall, after reading chapter 3 would be a great time to have the students create altars for someone they know, or a famous person who has passed away. These could be drawn on paper and described, or actually created in class. Instead, after I read and discussed chapter 3, we listened to the audio book of the chapter and students drew out the altar that is described, as well as the other people and events in the chapter. They then explained their drawings to a friend, once again reviewing the chapter.